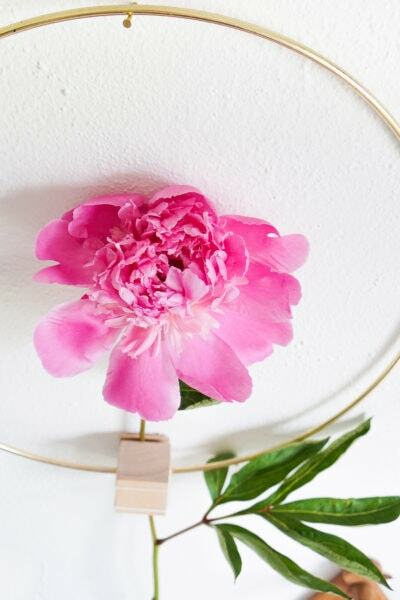 My backyard peonies are blooming up a storm right now, and they’re just too pretty not to snip a few and bring them inside to enjoy them around the clock. 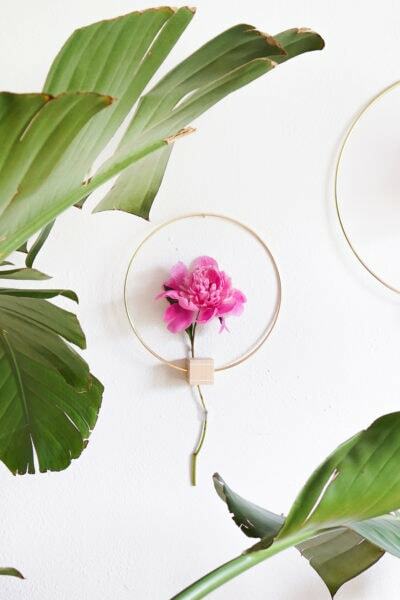 Inspired by their flora-abundance (see what I did there? ), I’ve been finding creative ways to display them in different parts of the house. 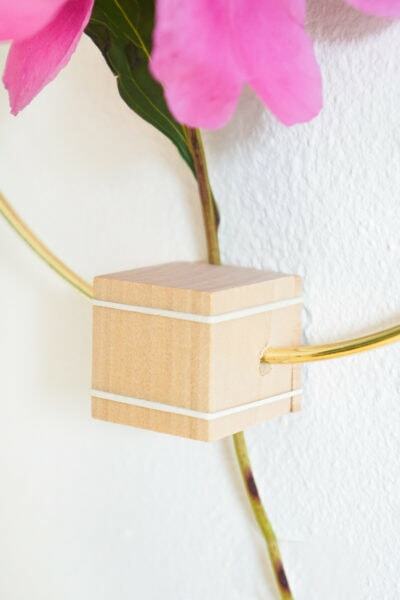 These minimalist vases made merely with gold hoops, wooden shapes, and rubber bands are a pretty cool alternative. 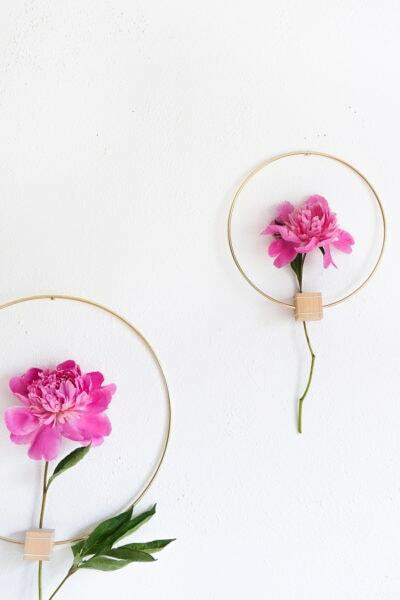 The simplistic design allows the organic lines of the flowers to really sing, and I, Erin, can’t think of a prettier way to deck the walls for Summer. 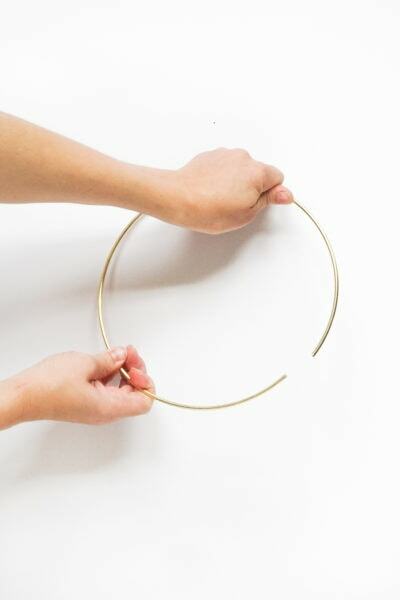 Snap apart the location where the ends of the gold hoop connect. 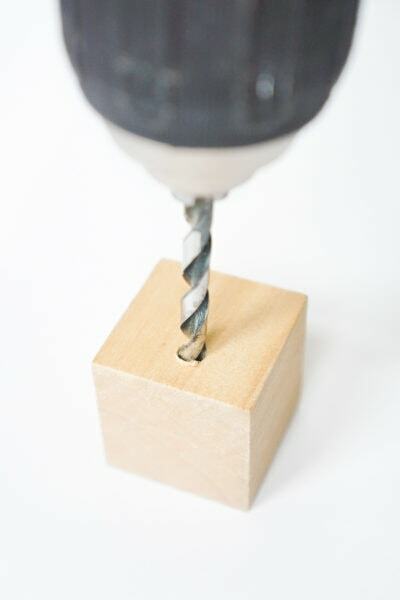 Drill a hole through the wooden cube. 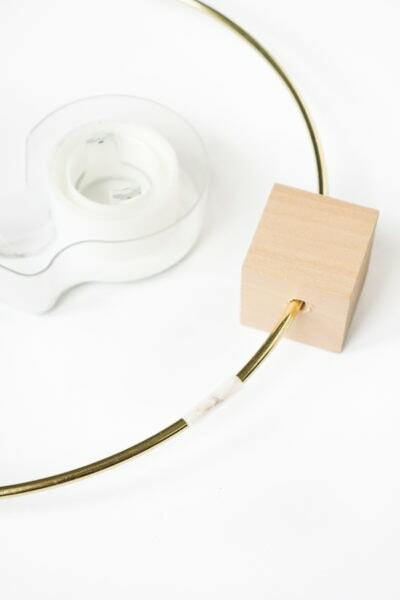 Locate the midpoint of one edge of the cube, and measure 3/8” inward. Make sure to drill straight down. 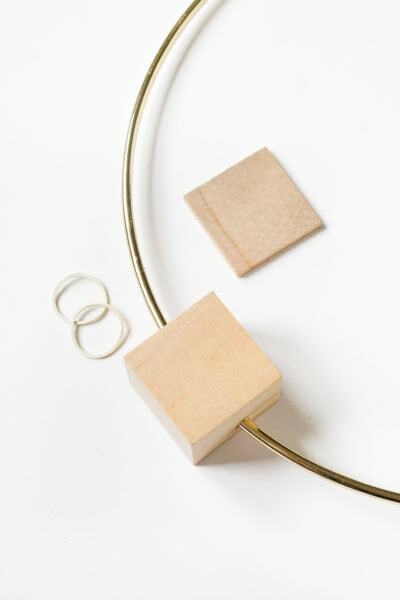 Slide the cube onto the metal ring and reconnect the two ends of the metal hoop with a piece of tape. 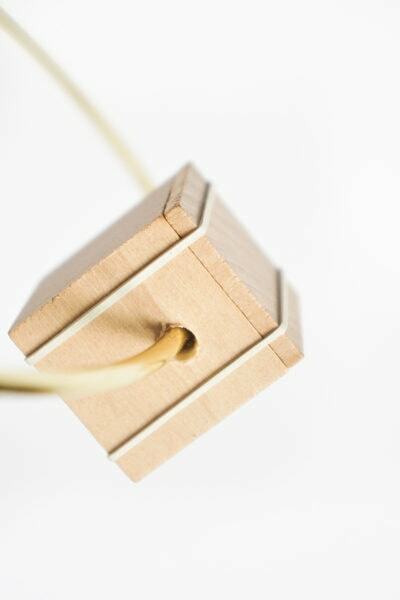 Place the square wood chip on the back of the wood cube and secure in place with two small rubber bands. 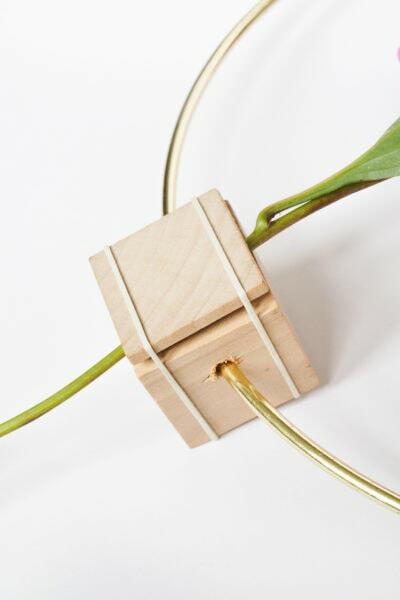 Slide the flower stem between the cube and the chip and center the bloom in the middle of the metal hoop. 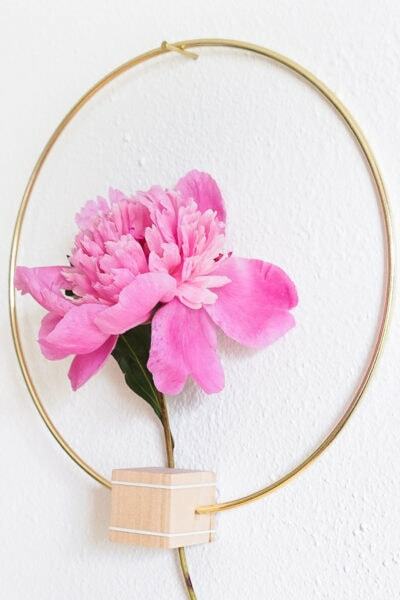 Now you are ready to display your wall hang! 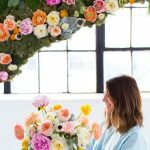 If you would like more flower longevity then I would suggest using a fake flower. I’m so glad! Such a brilliant idea from Erin! That’d be perfect! So glad you like the project. 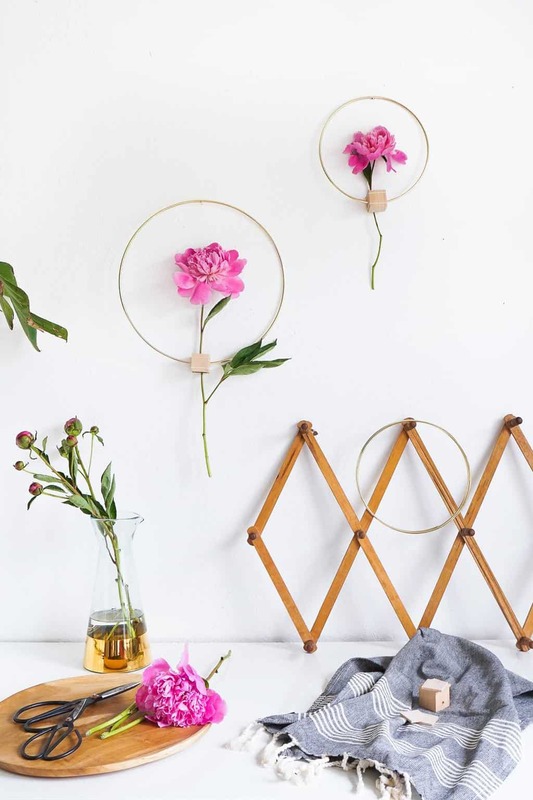 These wall hangings are so cute! 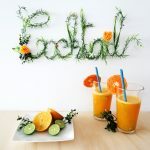 I want to make some for my office! 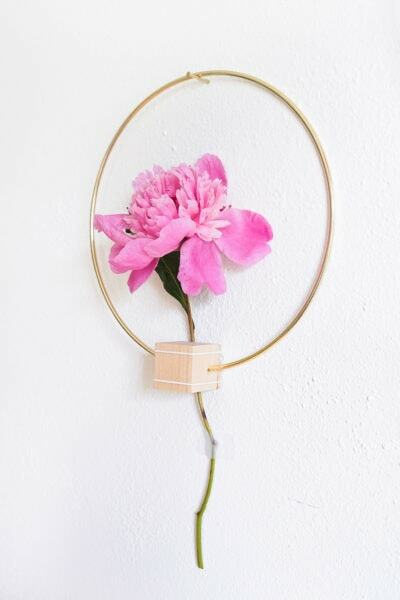 Erin is a DIY genius! What a great idea! I love how you can use these anywhere. 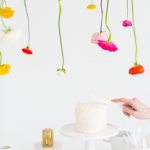 So great for a dinner party too… especially since they don’t take up any valuable table space. Genius! It seems easy! Im gonna try to make it! 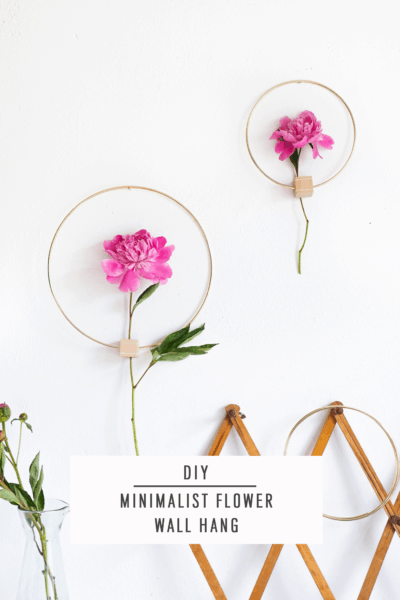 Do you have pinterest? Hi Camila! You can find us under ‘Sugar & Cloth’ on pinterest. Erin is ‘Francois et Moi’ on there too! 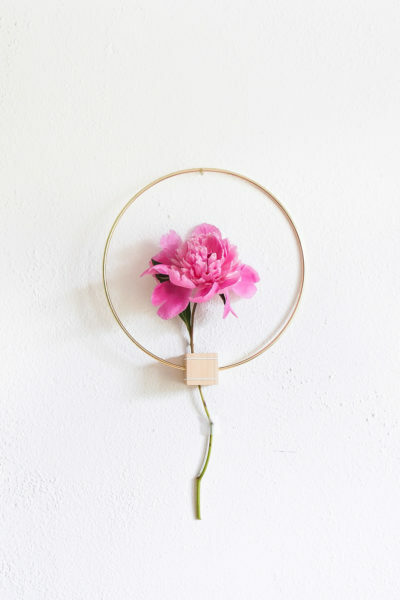 How cute and perfectly simple! 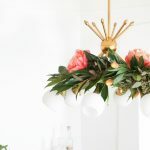 This is a great solution for fresh cut flowers constantly rotating in my house!